Audio Run Time: 9 hr. 49 min. A Hawaiian Mystery. Retired travel writer Natalie Seachrist has had visions since childhood. But the sight of a girl's lifeless body draped over a vintage Mustang shatters her personal world when she learns her vision has been prescient. The horrible truth is that her twin's granddaughter Ariel is dead! She soon discovers the fascinating Shànghai origins of apartment owners Pearl Wong and her sister Jade Bishop…and more than a little discord. Will Natalie be able to solve the riddle of Ariel's death before the police close their investigation without an arrest? Or has Natalie put herself in the way of a killer who's willing to murder again to hide their secret? Prospect for Murder is now available as a downloadable e-book from Amazon Kindle. Donload a copy of Prospect for Murder for only $4.99! Hardcover and Ebook available for order at Barnes and Noble, Amazon.com, OverDrive.com, and your favorite independent bookstore. Audio download available at Audible.com, Audiobooks.com, and OverDrive.com. 9-CD albums of the audio book may be ordered from Artemesia or the author. This is a very enjoyable book. If you enjoy cozy mysteries, this is a perfect book for you. I enjoyed it immensely. The book does center around an older woman so don’t expect any death-defying rumble tumbles. The lack of emotion Natalie displays was a bit odd but in looking back, I find myself detached from emotional moments as well. It is a bit predictable, at one point I wanted to scream – am I the only one who sees what is going to happen? But this was excusable as the book overall was very interesting and entertaining and educational – I had no clue of the history of Hawaii. 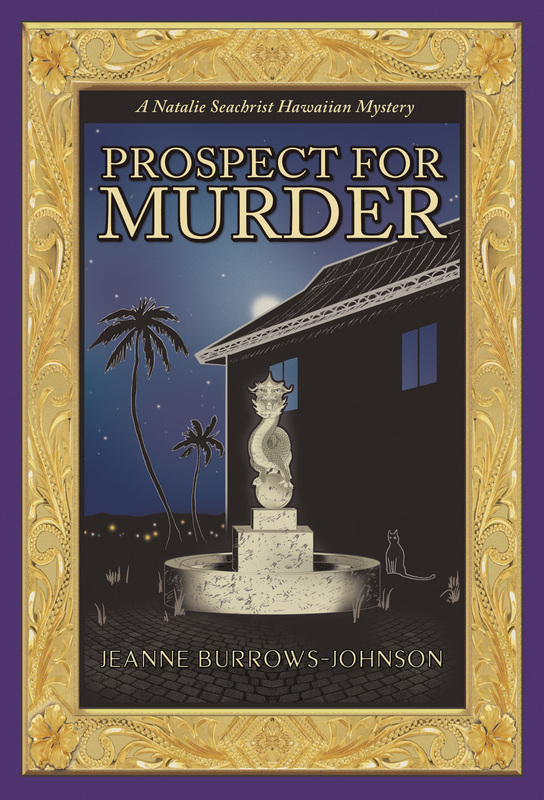 An deftly crafted and impressively engaging read from cover to cover, "Prospect for Murder" clearly demonstrates novelist Jeanne Burrows-Johnson as a master of the mystery/suspense genre. While very highly recommended for the personal reading lists of dedicated mystery buffs and community library Mystery Fiction collections. Cherie Jung - Over My Dead Body! 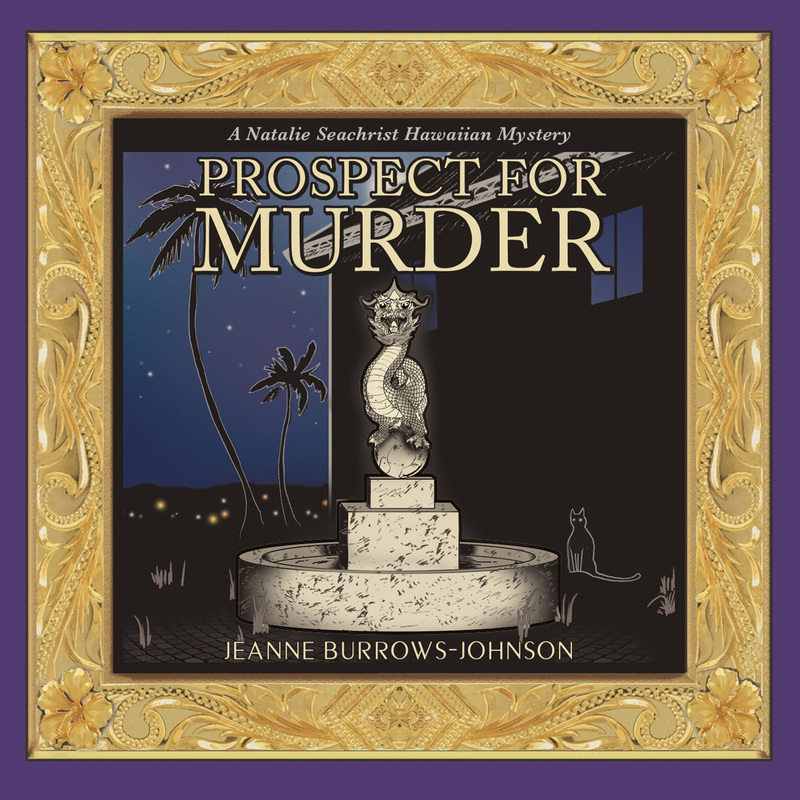 PROSPECT FOR MURDER is a murder mystery set in Honolulu. Natalie Seachrist is a 50-ish, semi-retired journalist, whose friend Keoni Hewiit, a retired homicide detective, has asked her to help him out on a research project. Suddenly, Natalie’s world is impacted by a terrifying vision. Throughout her life, since early childhood, Natalie has experienced visions. This time, the vision involves the gruesome death of someone close to her, her grandniece Ariel. As the local police continue the official investigation without much progress, Natalie devises a plan to carry out her own investigation into Ariel’s death. Natalie and her cat, Miss Una, take up residence in the apartment complex where Ariel died. She enlists the help of her friend Keoni. The reader’s attention will be captured the on page one of the prologue with the author’s descriptive writing style. Readers will quickly warm to the protagonist, Natalie, her cat Miss Una, and the many other memorable characters. The pacing of the narrative was perfect. The characters were well-developed, the storyline plausible, and the author’s descriptive writing skill will leave readers wanting more Natalie Seachrist and Miss Una stories…and very likely the reader will wish that they could know Natalie personally. I think Miss Marple and Jessica Fletcher fans will be especially delighted with PROSPECT FOR MURDER and I do hope there will be further sleuthing opportunities for Natalie! Set in the tropical paradise of Hawaii, this convivial mystery unfolds leisurely as Natalie sets out to determine exactly what happen, why, and whether or not foul play was involved. Hiding her connection to the deceased, she rents the actual apartment from which her grandniece fell so she can learn more about individuals who may or may not have been involved in the untimely death. These individuals include a Chinese landlady with a multifarious history, a handyman thought to be religious but also perhaps righteously indignant, a sullen hanger-on with questionable ties to the owners and the property, and a roommate mentioned but inexplicably unseen. Natalie is a protagonist who will inevitably draw comparisons to Jessica Fletcher from Murder She Wrote, perhaps even to Agatha Christie’s Jane Marple. Similar to those intellectually endowed ladies, Natalie brings precise observation and keen insight to her task. However, she also employs an additional armament not shared by those feminine sleuths. Natalie has visions—visions that enable her to see, sense, and feel more than the average person. The trick is interpreting those visions correctly. In this debut whodunit, Burrows-Johnson displays a fine eye for detail, a sharp ear for dialogue, and a commendable commitment to tie up loose ends. Her descriptions of time, place, history, and more make up in substance what may be lacking in suspense. One suspects this is only the beginning of Natalie’s adventures. "Being a resident of Hawaii, I could not pass up a murder mystery based in Honolulu. It was thrilling while at the same time oddly relaxing to read a story with so many local references to places, food, culture, and traits. I was quickly drawn into the narrative and enjoyed being in Natalie's head as she processed information and formulated her plans. The writing was insightful, observant, emotive, and intelligent. Each scene, task, and event was highly detailed and meticulously described - she really was a close approximation or the Hawaiian version of Jessica Fletcher, as her friend had teased. I savored the sense of familiarity as well as the intriguing storyline."